AccuServ is a full service accredited specialty pharmacy focused on putting patients first by providing the highest quality pharmacy services. We partner with you and your doctors to provide expert advice, compassionate care, simplified medication management through our pill packaging, and advanced pharmaceutical treatments. We help those facing sudden or chronic illnesses navigate the healthcare system with specialty services, 24/7 clinical support, and our convenient AccuPac®. You will have a single point of contact when working with our pharmacy. Our pharmacists are well trained in the latest drug therapies for specific diseases. We are experts at obtaining maximum insurance coverage for your patients and working through challenging reimbursement issues. We manage your prior authorizations, saving your office valuable time. We work with drug manufacturers and non-profit organizations to find your patients the lowest possible copays. 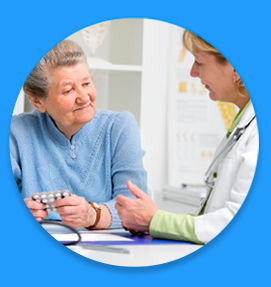 We specialize in complex or ongoing drug therapies for chronic conditions. In addition to your specialty medications, we can also help you manage your prescription or over the counter items. We take care of the details so you can concentrate on feeling your best. We simplify your medication management through modern technology and personalized service. Our new offering, AccuPac®, is an easier,prepackaged way to manage your medications at no additional cost to you. It's easy to forget if you have taken your pills and the AccuPac® helps my patients stay on top of their schedule. This is why I recommend the AccuPac® to all my patients who are managing multiple medications. Once again I must express my appreciation for the expeditions manner in which you delivered my recent prescription renewals. Thank you! ... I cannot tell you how much your service and dedication mean to me. Please accept my gratitude. I consider myself lucky to be a customer of one of the BEST pharmacies in the world! Thank you AccuServ Pharmacy®! Our referrals and Prior Authorizations are always processed promptly. They keep us informed, and always go the extra mile for our office. It is nice dealing with the same person each time. AccuServ Pharmacy® is great to work with! They make our job easier by taking care of our prior authorizations and copay assistance. They treat our patients as if they were family.